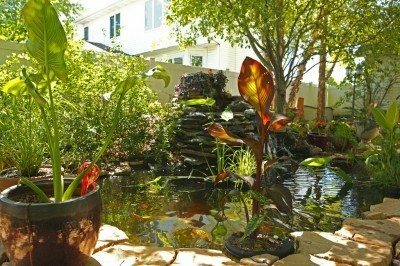 For gardeners who live in zone 6 or zone 5, pond plants that are typically found in these zones can be pretty, but tend not to be plants that look tropical. Many gardeners would like tropical plants to use by a goldfish pond or fountain but believe in their temperate area this is not possible. This is not the case though. There are many cold hardy tropical plants or bushes that can turn your water retreat into an exotic getaway. The corkscrew rush is fun and looks like an exotic tropical plant. The stems of this plant grow in a spiral and add an interesting structure to the garden. The large leaves of burhead plants give them the look and feel of tropical rainforest plants. The long stems of creeping jenny plant can create the feel of long tropical vines coming over the edges of walls and pond banks. The massive two foot leaves of the giant arrowhead plant can be a good copycat of the popular exotic tropical elephant ear plant. Always a time tried favorite, larger leaf hostas can also give the illusion of tropical rainforest plants growing around a pond. More fun plants that look tropical, and named because the flowers look like lizards tails, the lizard’s tail plant can help give the feel of small flitting lizards among your plants. Add some color to your tropical looking pond with the bright pink flowers of obedient plant. The feathery foliage of the exotic tropical plant, parrot feather, adds interest to the edge and center of a pond. The pickerel rush plant will provide exotic looking flowers all through the summer months and survives the winter well. This plant looks exactly like regular hibiscus. Unlike those tropical rainforest plants, however, water or swamp hibiscus, will winter over in the pond and bloom year after year. Adding more floral color, the shape of the water iris is reminiscent of the orchids you may find in tropical locations. This is just a short list of all the cold hardy tropical plants that look tropical that you can use around your pond. Plant a few of these by your pond and sit back to sip on pina coladas. Read more articles about Tropical Gardens.